People who are proud sometimes don’t know it – if they had a greater awareness of the extent of their pride, perhaps they would not be quite so proud. Something broadly similar happens to Molly Reeves (Natasha Zierhofer), who has a foreign object in her body but ends up stubbornly wanting it to remain, against the medical advice of Dr Cheryl Finch (Sheila McCabe), a surgeon. As ever, there’s a need to suspend disbelief, but even so, holes in the plotline of Headhog are significant, as though Reeves isn’t the only person to have (one might as well say it) a hedgehog lodged in her brain. Reeves claims not to be interested in how ‘Heady’, the name Reeves gives to the said hedgehog-in-head, or head-hedgehog, or whatever you will, got there. All she wants to know is why. Cue some philosophising, in which either some intellectual personal contacts or internal voices in Reeves’ head tell her that she herself must determine why that particular hedgehog is where it is. “It’s either me or the hedgehog,” Reeves’ boyfriend, Jason Gomez (Oliver Malam) eventually says, frustrated with Reeves’ obsession with Heady. Although there are some amusing scenes and punchlines, such as when Gomez abruptly withdraws mid-kiss from Reeves, asserting a prickly tongue on his girlfriend’s part, the narrative is sometimes prone to jumping too quickly between scenes without immediately making clear quite how long (as far as the story is concerned) has passed since the end of the previous scene. But at least the show spins a narrative in chronological order – I didn’t detect a single flashback. At the risk of coming across as the reviewer that doth protest too much, a late scene in which Reeves refuses treatment but is placed under sedation anyway in order to be prepped for surgery raises questions about ethics and informed consent. The other significant character in the play is Stan (Mike Kelson), Reeves’ father – Reeves still lives at home, and despite being 28 years of age and holding down a job, is cooked for and cleaned up after as though still a dependent child. A stroppy demeanour, albeit one at least partly to do with – yep, you guessed it – the presence of Heady, makes Reeves thoroughly dislikeable. Things only get worse post-surgery, and I got the impression Gomez got a lucky escape when Reeves tells him where to go. There’s a romantic comedy subplot involving Cheryl and Stan, which I wasn’t sure what to make of. Perhaps this was one of those very tightly-knit communities where more or less ‘everyone’ knows ‘everyone else’, and so it is quite normal for the surgeon scheduled to operate on a patient to come around for dinner to the patient’s house and start flirting with the patient’s father. The story raises more questions than it answers (whatever did happen to Reeves’ mother, for instance?) and while I appreciated the increasing absurdity of it all, there were moments when the play came across as not being as absurdist as it could have been to maximise comic effect. Overall, though, this was a subtle play, and although brief, made some interesting observations about irrational responses to irrational situations. Molly Reeves has a hedgehog in her brain. No one understands how it got in. And Molly wants to know why it’s there at all. The story of an ordinary woman whose life is turned upside down by a shocking discovery. As she desperately tries to find a meaning in the absurdity, Molly’s relationships break down around her. A tragicomic allegory of how we tackle the absurd in our everyday lives. The play was shortlisted in 2018 by the Talos Science Fiction Theatre Festival, Ink or Swim, Kibo Productions, Radius Theatre, WriteOn and The Write Hour Podcast. An opening extract from the play was performed by Metamorph at the Arcola Theatre on 8th July 2018. 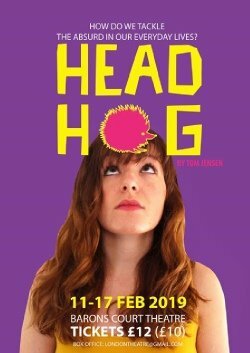 Headhog, written by Tom Jensen, is being performed at the Barons Court Theatre 11th-17th February 2019 at 19:30 (14:30 Saturday matinee).